This barn is typical of those built by Florida farmers in the late 1800s and early 1900s. Its design was determined by Florida’s climate which allowed farm animals to stay outside year round. The interior of the barn was used to store seeds, fertilizer, hay and farm implements. The outside sheds provided cover for farm machinery. The size of the barn was determined by the financial means of the farmer and the size of his farm operation. 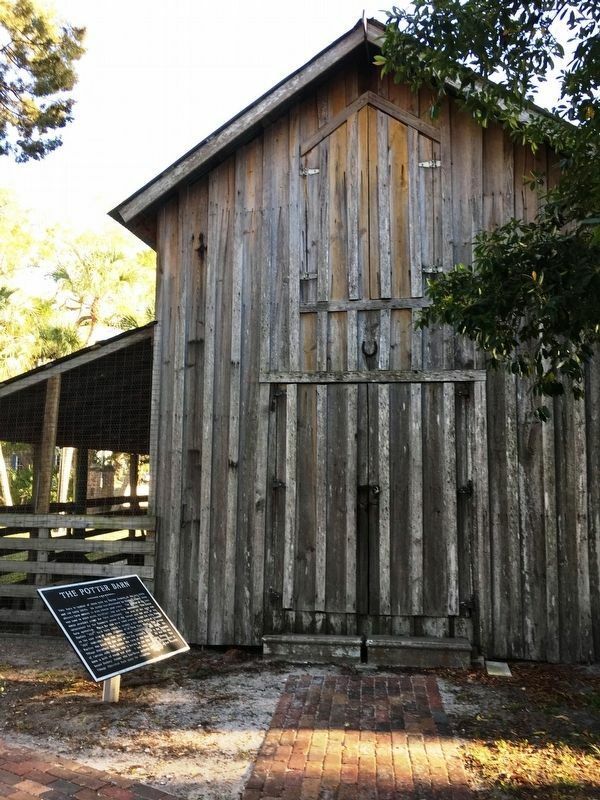 Plans for the barn were drawn to copy the John Pope Harilee “100” farm barn which is located a few miles north of the Palmetto on the east side of state highway 41 at Palm View Road. The phrase “100” indicated that the Harilee farm consisted of 100 acres. 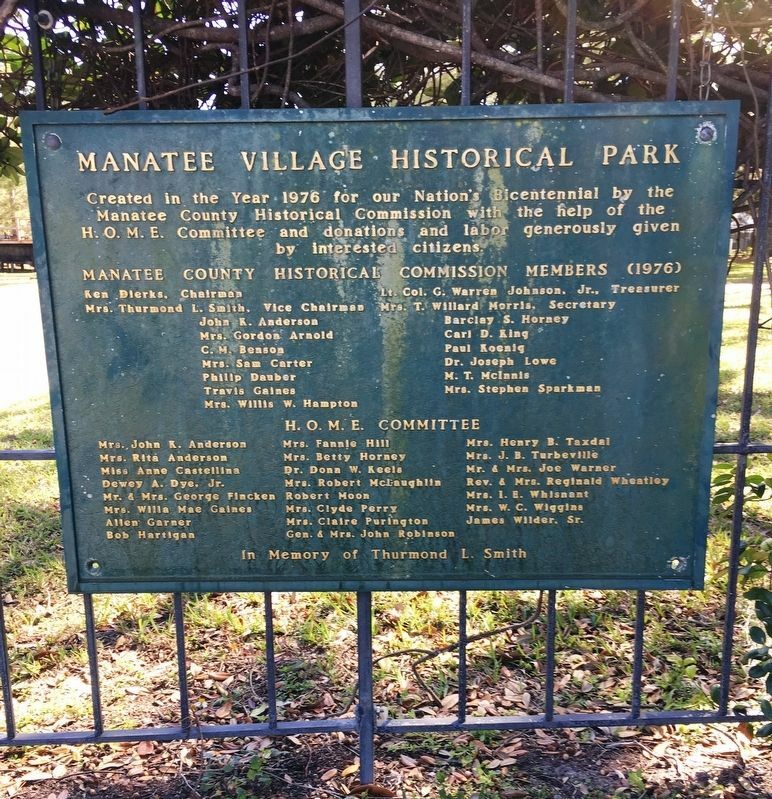 Mr. Harilee was born on the site of the old settler’s house on the Manatee Village Historical Park before the turn of the century. He was the son of Captain John Harilee who is buried in the Old Burying Ground . The barn is built of rough cut pine. 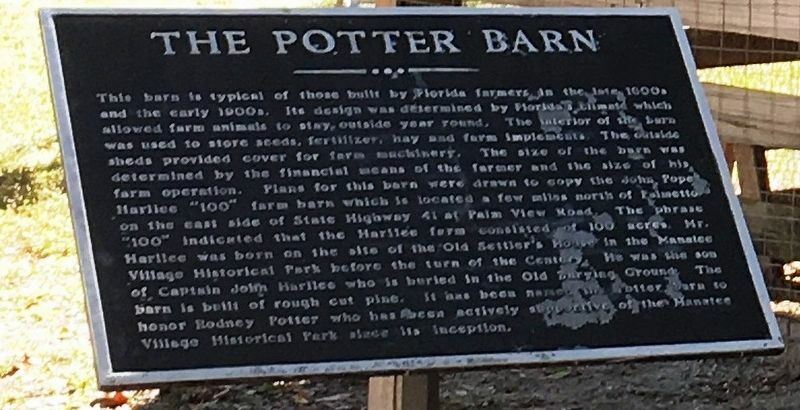 It has been named the Potter Barn to honor Rodney Potter who has been actively supportive of the Manatee Historical Park since its inception. 27° 29.677′ N, 82° 32.872′ W. Marker is in Bradenton, Florida, in Manatee County. 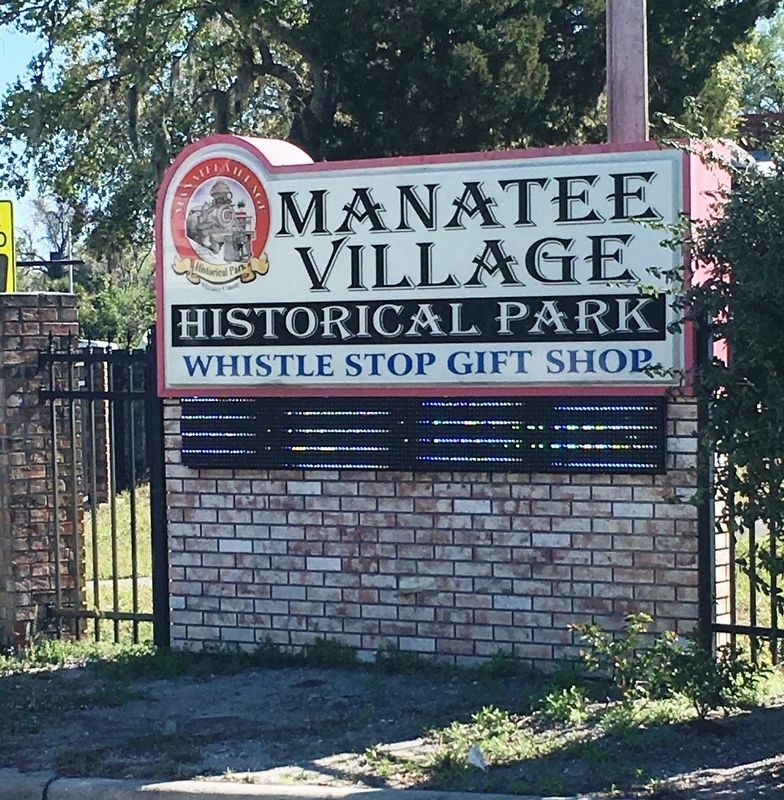 Marker can be reached from the intersection of Manatee Avenue East (State Road 64) and 14th Street East, on the right when traveling east. Touch for map. Marker is at or near this postal address: 1404 Manatee Ave East, Bradenton FL 34208, United States of America. Touch for directions. Other nearby markers. At least 8 other markers are within walking distance of this marker. William Bassett Chapter (here, next to this marker); The Stephens House (a few steps from this marker); The 1887 Church (within shouting distance of this marker); The Bunker Hill School (within shouting distance of this marker); The Smokehouse, Syrup Kettle and Sugar Cane Mill (within shouting distance of this marker); The Manatee River (within shouting distance of this marker); Life on the Florida Frontier: The Stephens Family (within shouting distance of this marker); Florida's Earliest Courthouse Building (within shouting distance of this marker). Touch for a list and map of all markers in Bradenton. More. Search the internet for The Potter Barn. Credits. This page was last revised on March 24, 2019. This page originally submitted on March 22, 2019, by Brandon D Cross of Flagler Beach, Florida. This page has been viewed 86 times since then. Photos: 1, 2, 3, 4. submitted on March 22, 2019, by Brandon D Cross of Flagler Beach, Florida. • Bernard Fisher was the editor who published this page.